Floral Design Day is the perfect day to appreciate and create floral arrangements. Lia Russo from Ghirlandiamo says this is my made in Italy spring wreath: tender green and fuchsia! It’s one-of-a-kind gorgeous wreath, its colors are cheery and intense and create a vivid contrast against the dark base. The crown is made by a multitude of gnarled twigs, woven together and closed in an invisible wire structure. It’s a so very beautiful twine that l decided to do not decorate all, just to let you appreciate its beauty. Here and there l added some stabilized moss * : as you know, in the spring meadows get greener, and then l decorated with fuchsia hyacinth and green buttercups. The color contrast is outstanding and the final sight impact is extremely pleasant. This decorative wreath will never be unseen everywhere you put it: it’s perfect on your fireplace, in the entry room or in living room. * stabilized = a natural product which sap has been substituted for glycerin and water. This process keeps it unchanged in colour and look for many years. The plants are alive but they need no further maintenance. If the moss should become too dry, just vaporize on it some water with a spray bottle: it will be soon soft again. Dawn Whitehand from DeeDeeDeesigns discusses about how these handmade ceramic buttons are impressed with a daisy stamp while still soft and are glazed in a glaze specially designed to highlight the pattern. They are ideal for sewing, crochet, knitting and jazzing up hats, scarves and bags. Evelyn and Lucy from artsyEVE states these tooth-fairy/learning pillows are so fun and there is a lovely dark floral print on each of the roofs. Susan Fowler from SSFDesigns says each flower is 100% silk in different bright colors . Purple, lime green, red, blue and a plaid in all the colors . First I cut out a simple floral shape then twist the fabric t make it more 3d and then sew that and then sew them onto the neckline . Taking about 45- 1 hour for each flower. The dress and its bright colors where inspired by an artist friend who makes these beautiful floral paintings in bright bold colored and I was inspired to make a dress with bright bold flowers ! Jolanta Pietrzak from AlabamaStudio discusses about how this is an original, minimalist necklace with natural dried lavender flowers enclosed in a glass bottle, framed in wire wrapped sterling silver. The necklace is perfect for spring-summer trends – remember SERENITY – one of the colors of the year 2016? I especially recommend for garden lovers. The pendant comes from the collection “A piece of the garden,” which I created to keep for a long time a part of my home garden in the form of seeds and flowers that I dried in natural conditions for over a month. The collection is a bit sentimental – in every of its element is a little piece of my garden – the space that surrounds me every day, inspires, but also allows me to take a breath. Hello, and welcome to Easter! The bunnies are hopping, the eggs are popping, and the flowers are blooming! Read on to find out the Top Ten Gifts on the Easter Bunny’s List this year, all from the Christmas in July Team on Etsy. Adorable cookie cutters give the kids something yummy and create warm family memories. Adorable, easy to sew pattern for Easter Bunny Plush Animals. Soft, lovely tote made with Easter in mind. What little girl, or boy for that matter, doesn’t want their very own bunny. Soft, cuddly bunny without the mess! Adorable bunny on a basket! Original artwork…the gift that becomes a family heirloom. A chocolate bunny for people who can’t have (or hate-do they exist?) chocolate! This cute bunny also comes in many other colors (pink, blue, yellow) in my store. Adorable chocolate bunny pin…works even if you’re watching those calories!!! Check out our Easter personalized candy bar wrappers. These make great favors for any Easter event. Great chocolate gifts for handing out at school or sticking in your child’s Easter basket. They can also be used as cards. Why send a regular card when you can send chocolate! Add an Easter theme to regular candy bars…adorable! Bunnies are a great addition to any Easter Basket! Or hide them for an Egg Hunt! Put goodies inside a plastic egg and put the plastic egg inside the tummy of the bunny (instead of an ice cube)! Boo-boo bunnies are great fun! These are great for teenagers, too. I sent my kids on a scavenger hunt for the bunnies, each giving a clue to the next bunny. The final bunny had money inside. What a great surprise! Adorable egg hidden inside a bunny…what says Easter more than this adorable little gift? For the kiddos far away, the Easter Bunny uses the USPS! Returning with the laughter and the light. Hi! It’s Rita from HandmadeBits4U once again. You must be scratching your head wondering what the heck is a “squared” gift. And why would members of the EtsyChristmasInJuly team be making them!! First of all, let’s define a square. According to TheFreeDictionary there are a least 8 different meanings when we talk about the word square as a noun. It could be a “T-shaped or L-shaped instrument for drawing.” It could be the “product obtained when a number or quantity is multiplied by itself.” When used as slang, it could be “a person who is regarded as dull, rigidly conventional, and out of touch with current trends” – this certainly does not apply to our team members by any means!! One of the more familiar definitions is “something having an equal-sided rectangular form.” It is this definition that has inspired many of the designs and creations by our team members for their designs and creations – squares can be readily seen in their product photographs! 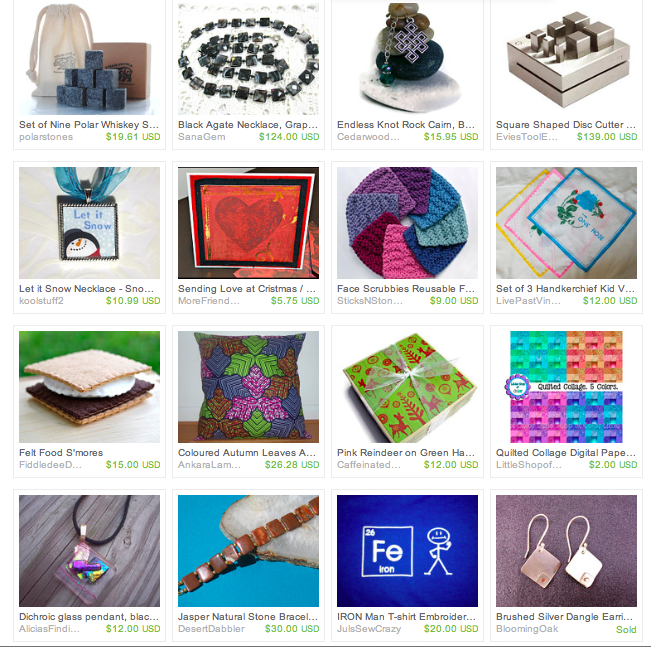 Here are a few “Squared” Gifts from our EtsyChristmasInJuly team members – you will find gifts soap, jewelry, face scrubbies, coasters, disc cutters, digital papers, pillows and more! To find more details about each of these just click here and then click on the item of interest. Aren’t all of these squares beautiful! !